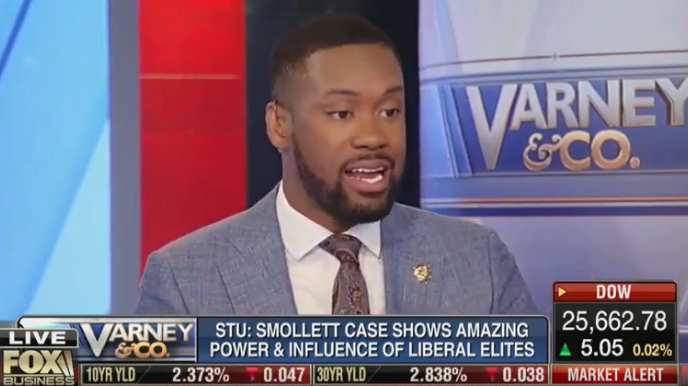 A Wednesday Fox Business segment labeled Jussie Smollett's exoneration a "travesty of justice" and sought to confirm conspiracy theories Michelle Obama called in "favors" to get his charges dropped by Cook County prosecutors. Fox Business host Stuart Varney opened his Tuesday segment declaring "the influence and power of liberal elites" was on full display in Chicago this week as Illinois prosecutors waived 16 charges against the Empire star. Self-proclaimed libertarian and Sean Hannity correspondent Lawrence Jones III touted unfounded and baseless claims former First Lady Michelle Obama "made some phone calls" to have the charges dropped in order to distract Americans from the disclosure of Special Counsel Robert Mueller's Russia investigation into President Donald Trump. Although Republican Senate House Majority Leader Mitch McConnell was behind the blocking of the full Mueller report, the Fox crew nonetheless accused Democrat politicians -- and their wives -- of corrupting Cook County prosecutors. “We know that Michelle Obama’s chief of staff made some phone calls," Jones said on Fox Business Wednesday. "I would also note that the reason why they released this now is because after the Trump investigation was concluded they knew during the news cycle this was the perfect time to release this.” The frequent Fox News guest cited Chicago Sun-Times, which reported Tina Tchen, a Chicago attorney who formerly worked for Obama, had previously asked Cook County lead prosecutor Kim Foxx to coerce the Chicago Police Department into turning the investigation over to federal authorities. Jones cited zero evidence for his claims that former President Barack Obama and his wife are pulling strings in Chicago. "[Michelle Obama] has the best approval rating out of any first lady or presidential candidate right now. Everybody thinks flowers about Michelle Obama. This will be sweeped [sic] under the rug. This is why it was the chief of staff that did it, so she wouldn’s take the hit. I think people are still going to love her," Jones continued. He added that Smollett "almost started a race war" in America, which corroborated his unfounded claim the Obamas tried the same during his time in the White House. The Tuesday Fox duo mocked Michelle Obama, saying she "loves capitalism" because her memoir may become the best-selling of its kind. An incredulous sounding Varney finally asked, "are you telling me, that within the black comunity, Michelle Obama can do no wrong?" Jones affirmed that suspicion and went on to make the comparison to how "a lot of black folks knew O.J. did it...they know Jussie did it."